Florida State Final’s are here! Amazing football has been played the entire season; teams have grindedand fought hard. 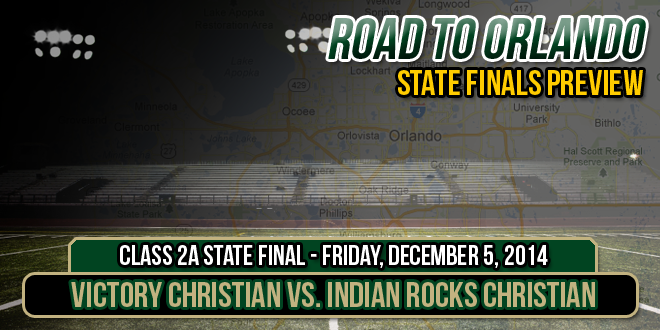 Now Victory Christian and Indian Rocks Christian get to battle out to see who is crowned champion! To read the full analysis of both teams and the matchup, visit the article here! Playoffs and bowl games are upon us! Now wins mean everything, and it’s time teams leave. With an impressive 80.6% correct on the season, it may seem like Pinko has Florida football figured out, but playoffs are a different beast, anything can happen! See how your predictions match up against his by checking out his Playoff picks here! There’s an area of Florida where the soil is so rich with nutrients that the consistency is almost like muck. While that area is known for the rich soil and the large amount of cane sugar grown in it, muck isn’t the only thing Western Palm Beach County is recognized for. With 12 football State Championships between them, Glades Central and Pahokee high school have a long standing rivalry and a bowl game named after the area- The Muck Bowl. Just 10 miles apart, these two schools have a tradition of football excellence. As noted by 3 Fish Productions in their documentary “The Muck Bowl”, it was reported that Glades Central had produced the more current NFL players than any other high school. While smaller, Pahokee had big names to boast about too. It’s storied that the boys in that area get stronger not only through practice, but also by chasing rabbits through the fields. Since the playoff era beginning in 1963, Glades Central has made 31 playoff appearances and Pahokee has made 26. Each number is extremely impresive and this was best seen during a stretch in the 2000’s when either school seemed to be winning state titles or reaching the finals! The Muck bowl being a big step in defining their season resumes. While Pahokee will miss the playoffs this year, you can expect a tough game and a huge crowd for this year’s Muck Bowl. A tradition that brings in sell out crowds and defines the true Friday Night Lights’ experience. 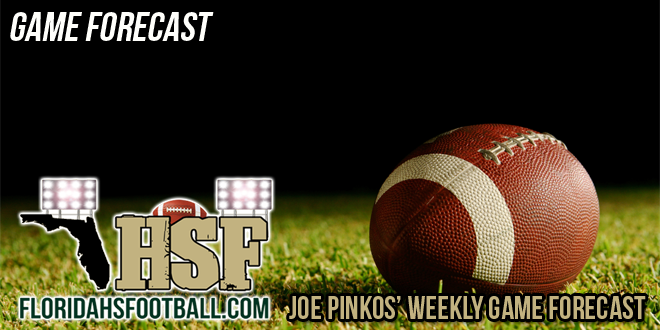 – Information and history provided by Josh, the owner of FloridaHSfootball.com. 210-38 for 84.7% correct. That is how well Joe Pinko did last week in his Game Forecast! With an impressive 80.8% correct on the season, it may seem like Pinko has Florida football figured out, but with teams making their playoff pushes, anything can happen! On top of their Playoff Watch, make sure to check out the weekly forecast where Pinko predicts the winner for each Florida high school football matchup. We know that Florida is a national powerhouse when it comes to ranked teams, but FloridaHSFootball.com and FLAVarsity.com team up to show you where those high school football teams rank in the state. Standing at the top spot, Booker T. Washington remains undefeated! To see who is ranked after them, follow this link to the Florida #HSFB Top 25.